Last week, the Satellite Sentinel Project, or SSP, reported on what appeared to be mechanized units of the Sudanese Armed Forces, or SAF, pointed toward the rebel stronghold of Kurmuk in Sudan’s Blue Nile state. 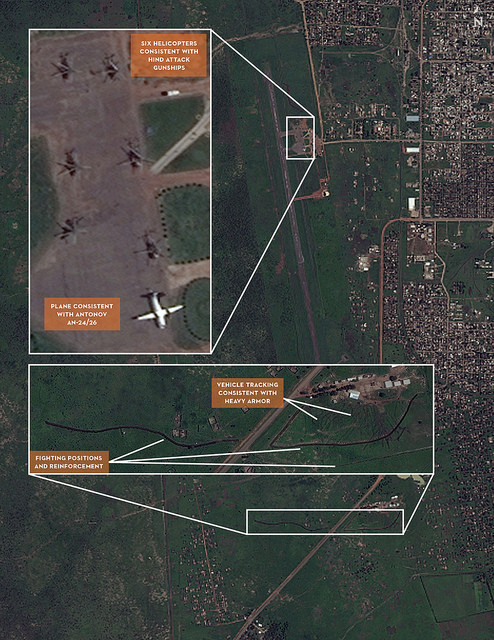 DigitalGlobe satellite imagery, analyzed by Harvard Humanitarian Initiative, appeared to show SAF forces comprising at least a battalion (3,000 troops), armed with tanks, towed artillery, armored personnel carriers and infantry fighting vehicles along with close air support from six Hind attack helicopters. SSP warned civilians in and around Kurmuk of the possibility of indiscriminate bombardment. Within hours, Agence France-Presse reported that SAF had indiscriminately bombarded the town. In the past week, an estimated 25,000 internally displaced people have poured over the Sudanese border, fleeing from indiscriminate bombing in Kurmuk to the relative safety of camps in neighboring Ethiopia. President Omar Hassan al-Bashir said Sudanese government forces were poised to attack a stronghold of armed rebels in Blue Nile State, and vowed not to negotiate with what he called mutineers, state news agency SUNA reported on Wednesday. (…) "President Omar al-Bashir declares that the armed forces will pray in al-Kurmuk soon," SUNA said, meaning that his military intended to take the town near the Ethiopian border that is seen as an SPLM-North stronghold. Bashir denies blame for the intensifying conflict, claiming that the Sudan People’s Liberation Movement-North is at fault for provoking the confrontation. The SPLM-N accuses Khartoum of being behind the attacks. Benjamin characterized SSP’s September 23 report warning of the threat of attack on Kurmuk as “bowel-loosening,” a crude but fitting evaluation of the emergent situation.